MOSCOW, August 10. /TASS/. The Union of European Football Associations (UEFA) opened disciplinary proceeding against Greek football club PAOK over fans misbehavior during the club’s home match in Thessaloniki against Russia’s Spartak Moscow FC on Wednesday. "Disciplinary proceedings have been opened following the UEFA Champions League third qualifying round first leg match between PAOK FC and FC Spartak Moskva (3-2), played on 8 August in Greece," the UEFA announced in its statement on Friday. The European governing football body reported that the disciplinary proceedings against PAOK FC were opened on charges of "use of laser pointer" and "stairways blocked." The statement from the UEFA added that the cases would be dealt with by the UEFA Control, Ethics and Disciplinary Body on August 23. 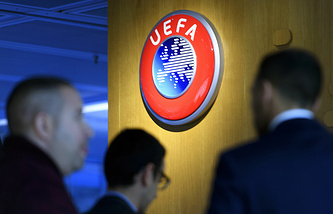 The UEFA announced to TASS earlier in the day that it had decided against opening a probe into numerous reports on an alleged assault on Russian journalists at the match in Greek’s Thessaloniki on Wednesday. Russian journalists working at the match reported on their social media accounts that they had been attacked by PAOK’s fans before the match at an entrance to media tribune of the Toumba Stadium.